There was a frightening message waiting for many Angelenos last Friday as they fired up Waze for their evening commute. Two freeways were closed—one covered in a mudslide—and for many, the app warned of drive times that were doubled or more. The entire city of LA simultaneously canceled its dinner plans. A group of my friends were trying to meet in the San Fernando Valley at this very moment, so I fired up the Google Transit app for a little thought experiment. Commuting from downtown LA to the Valley in a timely manner was pretty much impossible until they reopened the 101 Freeway—Waze said it would be an hour on an alternate route. But the Red Line subway traveled directly underneath the closure, delivering someone to the Valley in just 18 minutes. For someone who uses it regularly, considering transit is given, but despite having the second-largest system in the country and a very visible branding campaign, Angelenos sometimes need a reminder that transit is even an option: One friend who checked Waze had already resigned herself to the drive until I showed her my math, and she went underground instead. This is kind of an extreme case. But it shows you how much Angelenos—at least 1.3 million of them, according to Waze—not only rely on this app but trust it to tell them exactly what to do. 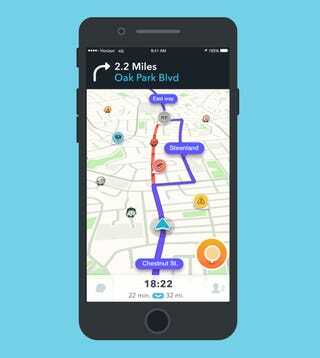 A redesign out today makes Waze even more powerful. But it also points to a simple way that Waze could actually help improve transportation for cities. Waze should be telling people when they can save time or avoid a particularly awful commute by getting out of the car. For an app that you’re supposed to be looking at while driving, I’ve always thought Waze has an incredibly cluttered interface. That got a little bit better today with some streamlined icons and better map design. 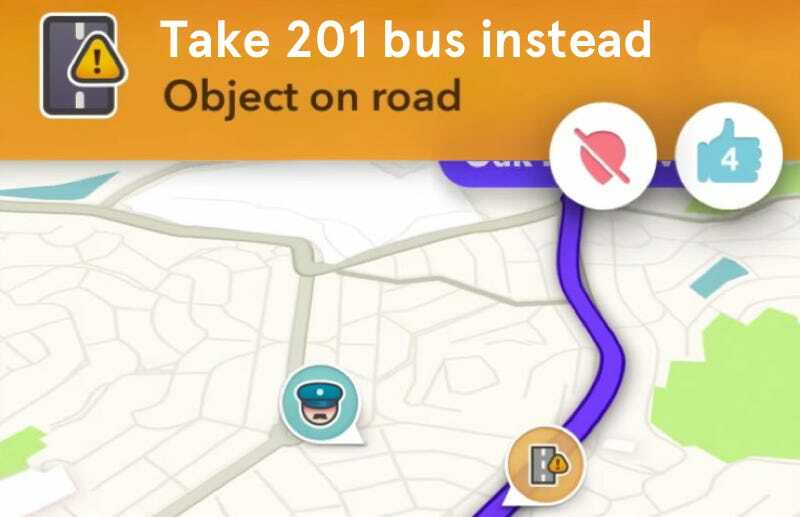 I still find the graphics to be far too cartoony, but that’s part of the intention: Waze is trying to make commuting fun by turning it into a game. This is the real strength of Waze and why its adoption has been so incredibly speedy. Users can squeeze a little bit of enjoyment out of their hellacious drive by reporting hazards or sharing data. Fans also like to beat their estimated arrival times or take weird new routes. Dare I say Waze has made driving more adventurous, and perhaps even more fun. But the redesigned interface is only part of what’s being hyped on today’s Waze update, which is already available on iOS with a Android coming soon. Now, if you sync your calendars with addresses plugged in for your appointments, Waze will tell you according to real-time traffic when you should leave. There’s the option to add a stop to your itinerary (finally), and a feature that will tell you exactly how long you can plan to be stuck in a particular traffic jam. Taken all together, that’s a pretty powerful suite of trip-planning tools. Wazers will be the first to brag to you about their ability to “beat” traffic. But Waze isn’t really making traffic better by prompting drivers to take alternate routes. Telling certain cars to take certain streets might briefly alleviate conditions—but it doesn’t solve the overall problem. If the goal is truly to reduce vehicular congestion—and Waze has said in the past that this is why they’re sharing their data with cities—then Waze should also provide an option that gently suggests you might want to become part of the solution by getting out of your car (or incinerating your car, whichever fits best). How would this work? It wouldn’t actually be that different from how Waze works right now. When you punch in your destination, it might just show you the alternate route in a different color, like Google Maps does now. Just like the sneaky little ad for Uber—“ALSO CONSIDER”—that slips into the bottom of the Google Transit directions, all Waze would have to do is add a comparison which might compare transit, biking, or walking times to potential drive-time estimates. Since Google already owns Waze, it shouldn’t be a problem getting the real-time arrival data from transit agencies. Since Waze already tracks gas prices, it could also help save its users a lot more money. The app could add a price comparison that includes fares and show drivers just how much they could save on other modes. Moovel, a route planning app that’s not yet available in the US, integrates this information particularly nicely into a robust tool, and even has a calorie-burning comparison for active transportation methods. Waze’s tools would also benefit those who walk, bike, and take transit. I’ve long been jealous of Waze’s social features: I love how easy it is to send real-time geolocated tracking updates to a friend, which would be great for walking or biking. Now imagine being prompted to leave early due to a slow bus, or know exactly how long you’d be waiting at a light-rail station for a service delay. Walkers and cyclists could report things like bad sidewalks and potholes, too—and they would be far better than cars at spotting them. Something I hear so often from Wazers is how much they love getting sent down strange streets and through new neighborhoods. How different is that from Waze prompting them to jump on a bus or consider walking a few blocks? If, day after day, you saw a nearby rapid bus popping up as a better option, wouldn’t you want to try it? The data doesn’t lie, and people are used to trusting Waze’s suggestions as the Word of God. With 10 percent of the population in LA currently using the app, Waze could make a much bigger impact than a well-funded pro-transit campaign. Suggesting alternate transit modes might also help endear the app to its harshest critics, who are angry about data directing more cars down their residential streets. If the goal is truly to “outsmart traffic together” as Waze so proudly brags across its site, the only way that’s ever going to happen is if a few of those people get out of their cars. For good.